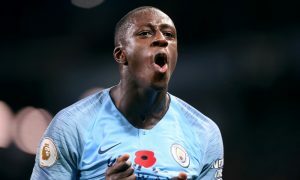 Benjamin Mendy continues to chronicle his eventful and entertaining life on social media, and yesterday kept fans updated about his trip to London via an Instagram story. Mendy arrived at Holborn tube station in Central London for a day out with friends, before taking the busy tube to Harrods. Once in the upmarket store, Mendy met Tottenham and England star Dele Alli, the two posing for the camera. Did they plan to meet or was it a chance meeting? Their respective teams are battling for Premier League supremacy but Mendy, 23, and Alli, 21, appear very friendly off the pitch as the snapshot below shows. Left-back Mendy continues his slow recovery from a ruptured the anterior cruciate ligament in his knee, but is keeping fans entertained on Instagram and Twitter in the meantime. City Summary – November 11: City loanee gets England call-up, Emre Can could join for free, new deal for Sterling?